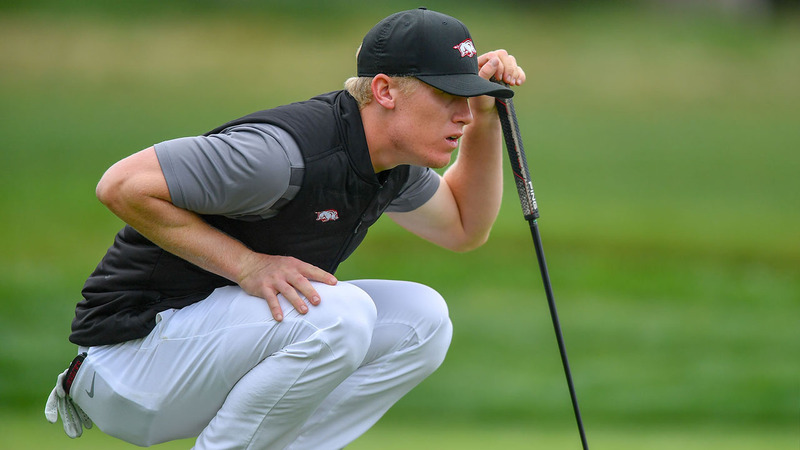 AUGUSTA, Ga. – The Arkansas men’s golf program carded rounds of 277 and 280 for a 36-score of 19-under-par 557 to stand in third place at the Augusta Haskins Award Invitational, played at Forest Hills Golf Club (par 72, 7,005-yards). Four Razorbacks are under par and in the top 25, including Tyson Reeder (2nd), Mason Overstreet (12th), Julian Perico (25) and William Buhl (25th). Wake Forest, ranked third nationally, leads the 15-team field with a scored of 547, followed by #7 Texas (549), #37 Arkansas (557), #19 South Carolina (558) and host Augusta (567). Reeder carded eight birdies with no bogeys in the opening round and added a 2-under-par 70 in the afternoon session to stand in second place with a 36-hole total of 10-under-par 134 (64-70). The 64 in the morning was a career-best, ties for the lowest round by a Razorback this season and ties for third on the school’s all-time list behind a pair of 63’s. The 134 for 36 holes is Reeder’s career-best, two-round total by seven strokes. In the opening round, Reeder opened with three pars before carding birdies on five of his seven holes. After four more pars, Reeder closed his round with birdies on three of his last four holes for his 64. In the second round Saturday, Reeder had his first bogey of the event, but immediately answered with a birdie. Two holes later, he dropped another shot but once again responded with a birdie on the following hole to get back to even for the round. Reeder wrapped the afternoon with eight pars and two birdies for a 70. Overstreet shot an opening-round 74 but came back in the afternoon to shoot a 6-under-par 66 to rocket 37 spots up the leaderboard into a tie for 12th with a score of 140 (-4). The 66 is Overstreet’s best round of the season and 23rd career round in the 60’s. The junior was even par in the morning through 14 holes but suffered bogeys on his 15th and 16th holes to stand at 2-over (74) through 18 holes. Overstreet started the afternoon with four pars before posting six birdies over his next eight holes. He offset a bogey on his 17th hole with a birdie on his 18th hole to finish with a 66. Perico and Buhl both stand in a tie for 25th with a two-round total of 143 (-1). Perico shot a 2-under-par 70 in the first round thanks to four birdies and two bogeys. In the second round, the freshman shot a 1-over-par 73. Buhl shot an even-par 72 in the first round, getting three birdies and three bogeys. In round two, the junior moved up nine spots into a tie for 25th with a 1-under-par 71. Luis Garza, who had eight birdies on the day, is tied for 51st after turning in a 36-hole score of 3-over-par 147 (71-76). The Augusta Haskins Award Invitational will conclude with 18 final holes on Sunday.